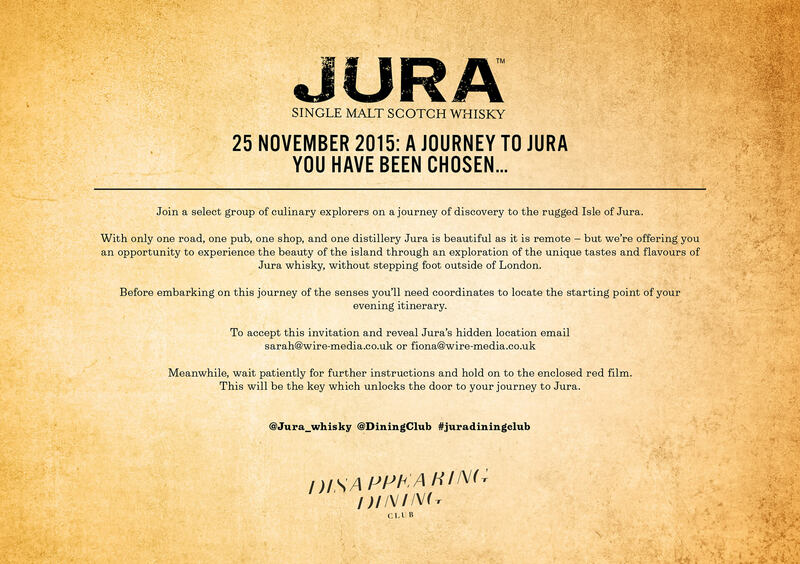 In partnership with ‘disappearing dining club’ we created a unique ‘Journey to Jura’ dining experience with well curated menus hosted in a antique store beneath Victorian rail arches in London. We created our own ‘disappearing dining’ invite to kick off the mystery and excitement for influencers and media. The venue of the event would only be revealed when a red film was placed over the cryptic jumble of words. Our invite successfully secured 100% media and influencer event attendance. Our guests enjoyed an amazing four course meal that gave a true feel of life on Jura. As the evening progressed the intensity of the flavors and smokiness in the whisky was set to intensify throughout the evening.